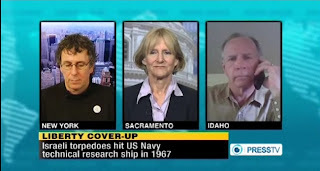 Press TV, Iran’s English-language propaganda television station, marked the 45th anniversary of the sinking of the USS Liberty by interviewing anti-Israel and anti-Semitic activists Alison Weir, Michael Santomauro, and J. Bruce Campbell. During the interview, which was held on June 8, the trio accused Israel of purposefully targeting the U.S. warship during the height of the 1967 Six-Day War. (The circumstances surrounding the U.S.S. Liberty, an American ship that was unintentionally fired on by Israeli forces, has been regular fodder for anti-Israel conspiracy theorists.) The interview also included several anti-Semitic statements and conspiratorial accusations of Jewish control over the U.S. government. Alison Weir, president of the Council for the National Interest (CNI), an anti-Israel organization that opposes U.S. aid to Israel, added to Santomauro’s comment about the pro-Israel lobby and characterized the U.S-Israel relationship as an “extremely unhealthy situation.” Weir also said that large sums of donations from pro-Israel groups are the cause of “tragedy, misery, violence and war after war after war.” Weir’s comments are consistent with her record of using anti-Semitic imagery and portraying Israel and its agents as powerful forces that control American policy through intimidation and deception. A summary of pro-Israel campaign donations for the period of 1990–2008 collected by Center for Responsive Politics indicates current totals and a general increase in proportional donations to the US Republican party since 1996. The Washington Post summarized the Center for Responsive Politics' 1990–2006 data and concluded that "Pro-Israel interests have contributed $56.8 million in individual, group and soft money donations to federal candidates and party committees since 1990." In contrast, Arab-Americans and Muslim PACs contributed slightly less than $800,000 during the same (1990–2006) period. J.J. Goldberg wrote in his 1994 book Jewish Power that 45% of the Democratic Party’s fundraising and 25% of that for the Republican Party came from Jewish-funded Political Action Committees. Richard Cohen, a columnist for the Washington Post, updated those figures in 2006 citing figures of 60% and 35% respectively for the Democratic and Republican Parties. According to the Washington Post, Democratic presidential candidates depend on Jewish sources for 60% of money from private sources. This process has become more targeted over time according to Bard, "In the past, Jewish contributions were less structured and targeted than other interest groups, but this has changed dramatically as Israel-related political action committees (PACs) have proliferated." Among politicians considered unfriendly to Israel who AIPAC has helped defeat include Cynthia McKinney, Paul Findley, Earl F. Hilliard, Pete McCloskey, Senators William Fulbright and Roger Jepsen, and Adlai Stevenson III in his campaign for governor of Illinois in 1982. The defeat of Charles H. Percy, Senator for Illinois until 1985, has been attributed to AIPAC-co-ordinated donations to his opponent after he supported the sale of AWACS planes to Saudi Arabia. Donations included $1.1 million on anti-Percy advertising by Michael Goland, who was also a major contributor to AIPAC. Former executive director of AIPAC, Tom Dine, was quoted as saying, "All the Jews in America, from coast to coast, gathered to oust Percy. And the American politicians - those who hold public positions now, and those who aspire - got the message". PS: An anti-Semite condemns people for being Jews. I am not an anti-Semite. Press TV: Is it true that there’s a prerequisite for anybody who wants to run for Congress that they actually have to sign a pledge, one of the things in the pledge is that Jerusalem al-Quds is the capital city of Israel; another one that they have to make a commitment to support the military superiority of Israel in terms of the assistance that the United States gives? Is that indeed true; and how is it that something like this has to be in the form of a pledge for people running for Congress? Santomauro: Well, it’s not a formal pledge where you’re signing your name to it but it’s pretty implicit that, you know, you have to give speeches to make it clear to the fundraising crowd that that’s going to be your position, that Israel comes first in that region, no matter if you’re right or wrong. If anybody criticizes the United States veto vote in the Security Council, they get marginalized or they get voted out of office. People on Capitol Hill here in the United States and Washington D.C. are very, very scared of AIPAC, of the Jewish lobby, the Israel lobby. It’s the strongest lobby when it comes to foreign policy. They dictate the terms. It’s not a conspiracy theory. There’s no sloppy thinking involved. It’s just a matter of where the money is coming from. 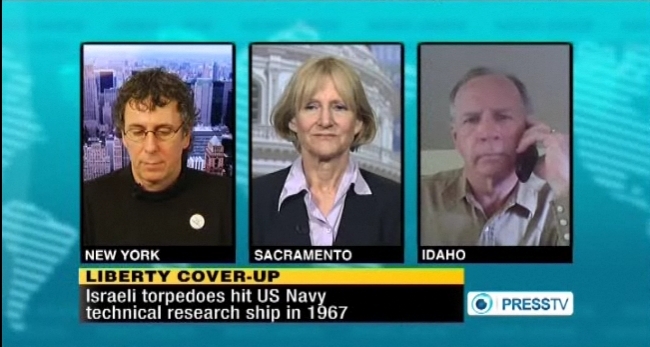 Press TV: Go ahead, Michael Santomauro [in response to guest speaker Alison Weir’s comments]. Santomauro: Alison makes a point about the individual Jewish Americans and Israelis. They also get marginalized. Norman Finkelstein as of three or four years ago was banned from visiting Israel for ten years, so I guess he’s got six years to go. If you’re an academic and you have very, very strong reasoning abilities where you can influence the public or a segment of the public, you get marginalized. You get marginalized whether you’re a Jewish individual or non-Jewish individual in this culture. "In the new edition, all references in the text to a Hitler decision or Hitler order for the 'Final Solution' have been systematically excised. Buried at the bottom of a single footnote stands the solitary reference: 'Chronology and circumstances point to a Hitler decision before the summer ended.' In the new edition, decisions were not made and orders were not given." "... Many questions remain open ... All in all, how many bodies were cremated in Auschwitz? How many died there all told? What was the national, religious, and ethnic breakdown in this commonwealth of victims? How many of them were condemned to die a 'natural' death and how many were deliberately slaughtered? And what was the proportion of Jews among those murdered in cold blood among these gassed? We have simply no answers to these questions at this time." I'm confused Micheal. What is a 'semite'? All I know is that the attack upon the Liberty was NO MISTAKE. It was deliberate. American Jews like any other American should be loudly and persistently calling upon having the truth of this horrible venal attack against their own people brought to light and punish those on this side for their treachery in covering it up all these many decades. Screw Israhell and screw Jews. i'm curious as the what defines a denier of anything, including the holocaust..if i question the reasons for world war one, does that mean i deny that it happened? if someone questions the resurrection of christ, does that mean christianity is denied? the tomb was empty...what the hell more evidence do you need for a resurrection?...or...we've seen the horrible photos of dead and living emaciated people in the camps, what more evidence do you need for six million murdered in gas chambers? Amazing you guys and gal got to have your say considering most of the time these views are heresy to the ADL and Jews in general. We are at a point in history when finally we can say to the Jews, your game is up. You've been exposed, your holocaust didn't come till after 1977 after the Nazi party headed by a Jew mind you, protested your Jewish ness. After that, you people went gung how with your holocaust lies that for some reason only happened to you and are finally now being exposed thanks to the Internet. It may be short lived because Laws are now being discussed to make America like Germany and Europe where free speech may be a thing of the past. When the Jews start passing their draconian hate laws that will eventually morph into even questioning Jews and their history then we will know where we all stand. Watch for words like "insulting the memory of the Jews" or " "intolerable insult to the memory of the 6 million victims of the Shoah." to be a reason for an arrest for a hate crime. Don't be surprised because it is probably coming fast unless Americans and Righteous Jews fight these intolerable actions. Their is enough evidence to prove the holocaust a fraud. People are finally seeing that the Jews don't speak for us. We need to come together to expose these people. A typical tactic use by ADL and the rest of holo-industry is to rail-road the important issues. 1.Why can't we have an independent,scientific research in to the holo-claims? 2.Why do we HAVE TO BELIEVE in official,constantly changing and -on most occasions-absurd version of this part of our history? 3.Why-instead of the research I mentioned above -people who refuse to BELIEVE and looking for scientific proof are being thrown to jails,persecuted,murdered. 4.Shortly after the war were were presented with with many version in relation to a "murder weapon" used by Nazis during the so called"holocaust"
a.STEAM CHAMBERS IN TREBLINKA -PRESENTED DURING THE NUREMBERG TRIAL BY DR TADEUSZ CYPRIAN. At present only the "gas chambers' version is still floating ,restricted however to one camp in Poland. I recommend here a video made by David Cole during his visit to Auschwitz/Oswiecim and his interviews with people working in a museum there. Let me as well invite you to my website where-during the several years- I collected a lot of materials in relation to "holocaust"
We,humans, have the right to learn the truth. Unfortunately the Western media is FULLY controlled by Israel or pro-Israel agents who are in a position to switch right to wrong and vice versa. The Israelis tried their utmost to sink Liberty, had they succeeded before it screamed its SOS, they would have blamed the Arabs to have carried their criminal act, AS USUAL!!!!!. The same criminal entity who tried to sink Liberty was responsible for 9/11. The word El Qaida is nothing but a code name, invented to throw on it all Israeli and pro-Israel criminal and dirty actions on it. Unfortunately, as long as the US and its allies are controlled by Israeli agents and media, the really, free world will never see peace. Comparatively, the holoshit was only few years ago, now we have the capability of verifying almost everything ... even exhuming the dead and count them for a matter as serious as the six millions they claim, if ever it gets to that!!!!! It has been said so many times over the years, but criticism, by Americans about US foreign policy, specifically as it pertains to Israel versus American interests is not only healthy but essential if we are to preserve ANYTHING of our Constitutional rights to free speech to say nothing of the issue of REJECTING any more shoves to wars for /in defense of Israeli desire for total hegemony. ANYONE who has ever read anything by Alison Weir knows that she personifies a Class A professional journalist because she does her research and cites all her resources with care. The fact that the survivors of the USS Liberty "holocaust" were forced to silence for decades under pain of imprisonment and that the president at the time and the Congress failed to stand up for "our troops" should serve as a warning to all US military....surely that was one reason why this issue was so SUPPRESSED. FRIENDLY FIRE INDEED.. a 2 hour sustained multi agency attack in broad daylight in INTERNATIONAL waters against a ship that could not defend itself was nothing other than the actions of a treacherous traitorous regime. Had the attack been carried out by Russian, German or any other nation it would have been seen as an act of war. The small boat attack against the US COLE was labeled as an act of war of AQ. How could this 45 yr old suppression about LIBERTY be understood as less horrific than the COLE's attack? When Americans, especially my fellow US VETERANS demand a full in depth investigation into the Liberty's attack....(especially in light of the fact that the Hasbara machine continues to claim the 6 day 'war' as a defensive maneuver instead of the PREEMPTIVE planned destruction of neighboring military that it was)....there is an unyielding demand to get to the TRUTH of it and expose these dastardly lies for the propaganda that it is. ONLY THE TRUTH will end this ...its time for TRUTH....long overdue...as it is time for ending perpetual wars for Israel's "security". The only way to security is to stop killing others. If not now, when? if not you, who ? Thank you for including the comments of Michael S, he is very brave to oppose Israel and its unended war machine. I sincerely hope that you all end up living in the great Islamic Republic of Iran, so you can enjoy cursing Israel day and night and live the UTOPIA of the non-Zionist world. "btw, can you do me a favor and ask Ahmedi Nijad to take a bath and shave his beard, he looks a bit uh-mm d i r t y"
In Polish language we call ADL :p-ADL-ina. IT IS NOT "racist" for a professor such as Alan Dershowitz or for a professor like Kevin MacDonald to advocate for their ethnic group interests. The words for bigotry that are often used, such as anti-Semitic, anti-White, anti-Black, anti-Arab, anti-feminist, anti-gay and hundreds of other labels, are for the most part overstated. Instead, [the demonized viewpoints] should be seen as pro-White or pro-Jewish or pro-women or pro-traditional family and should not be considered shameful. These "pro" sensibilities are part of the human condition, not to be pathologized into an "anti." It is about group interests. A race or ethnie without a sense of peoplehood or identity will end up being used to achieve the goals of other ethnies. (Yes, ethnie, not ethnic). Our feelings or thoughts of peoplehood are not pathological. They are natural. The European-American will have White ethnic interests and it is not "racist" to have them. Just as Hispanics, Asians, Jews, and Blacks have their own ethnic interests, it should not be considered a pathology for Whites to have them. An ethnie without a sense of peoplehood will end up being used to achieve the goals of other ethnies. © 2012 Anti-Defamation League. Powered by Blogger.